Rev. 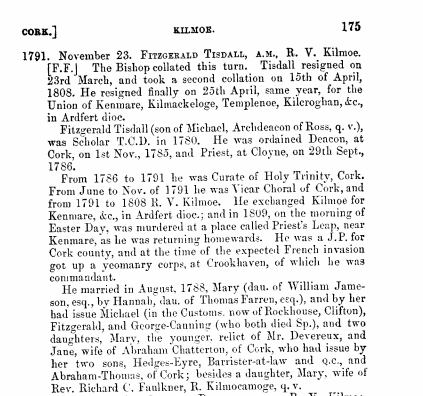 Fitzgerald Tisdall, Rector of Kilmoe (Goleen), West Cork, Founder and Commandant of Crookhaven Yeomanry Corps, Murdered at Priest’s Leap, 1809. In the 19th century Tisdalls married into the Murphy family of Bantry who in Newtown were millers, middling landowners, and were auctioneers. family members appear as jurors, and local administrative bodies. The impressive ruins of the mills are about a mile outside Bantry on the Glengariff road. The Olympic champion in the 400m hurdles in Los Angeles in 1932 was Bob Tisdall of Ireland. I recall my mother talking years ago about his Bantry connection. When Thomas Barr reached the final in the same event last week in Rio, it was said on a number of occasions on TV that it was the first time that this had happened to an Irishman in 84 years. However, Bob Tisdall was not mentioned by name. I suspect that the Rector in this article must be connected to our once famous Olympic champion in some way. Our high achievers are sometimes quickly forgotten.